The song says, “The sun’ll come out tomorrow” and for five days the week before Christmas in Las Vegas, it didn’t. 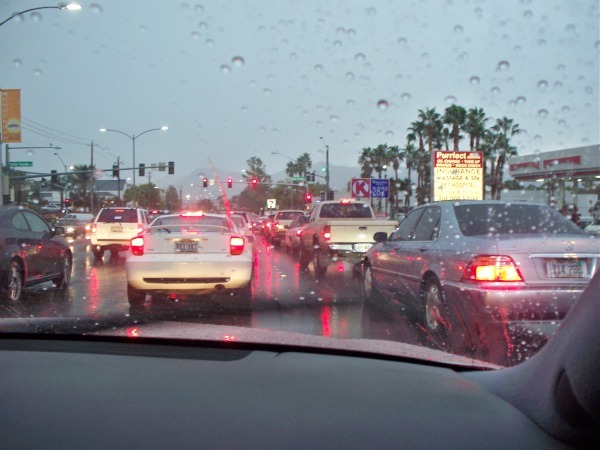 Five days of rain produced record Las Vegas valley rainfall. The winter storms that caused so many problems across the country brought record rainfall in the Las Vegas valley. Yes, Las Vegans missed the ice storms and blizzards. However, with the rain, came dangerous flooding, and for those of us who live with 300 days of sunshine, a bit of confusion. Slick roads caused a number of accidents. We searched madly for the umbrellas brought from from the old country (i.e. some state in the Midwest). And convincing the dog to go outside was more than a challenge. The rainy weather had some positives, of course. Some folks felt the gloomy days pre-holiday were quite like those back East and made them nostalgic. Others cheered that water levels in Lake Mead might creep up a few inches. Thrifty locals turned off their sprinklers, preferring to let Mother Nature provide the valuable water that refreshes the landscape. Some, like this reporter, noted that in Las Vegas, local entertainers can make the season just as bright as sunshine. This reporter attended two “Old Vegas” informal events hosted by local entertainer Kelly Clinton. The first was a week before Christmas, a holiday sing-along at the Stirling Club at Turnberry Place where Clinton is Entertainment Director. Live music accompanies Clinton and guest singers as they welcome the holiday season. The short video above features Clinton’s husband, Clint Holmes, and his sister, Gayle Steele, having fun with an impromptu “Jingle Bells”. The Stirling Club is a private club, but guests are welcome if a member leaves the guest’s name with the concierge. The second event was Clinton’s Open Mic Cabaret at the Bootlegger Bistro Monday evening. Las Vegans who enjoy live entertainment for the price of a meal and who don’t mind a late night, love Monday nights at the Bootlegger. The Open Mic starts at 9:00 p.m. Clinton hosts the show and local professional and amateur talent come to perform…just for the fun of it. Some Monday nights are better than others, but a week ago Monday was a real treat. 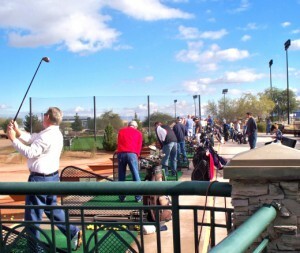 Housebound for five days, golfers on Thursday before Christmas crowded the Callaway Golf Center driving range. Thursday before Christmas, the sun finally appeared. 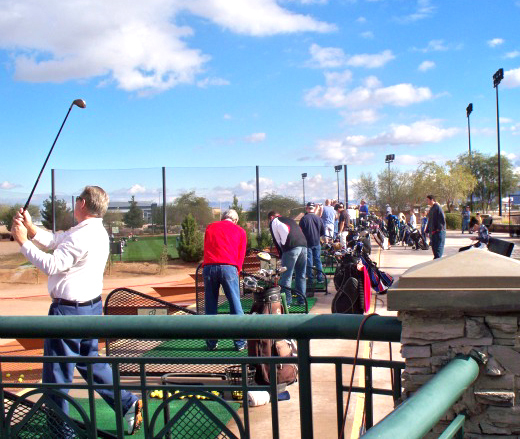 This reporter has a standing golf and lunch date at Callaway Golf Center for Thursdays. Though our group plays nine holes of golf, we noted many housebound locals packed the Callaway driving ranges after five days of rain. So Las Vegas enjoyed a somewhat different kind of holiday season in 2010….but that also means, 2010 gave us a holiday season to remember. What a great story and loved the video. Good to see Gayle and Clint and Kelly and Clint. Thanks!